The 40.5 metre motor yacht Anya has been listed for sale by Christopher Head and Cassidy Woods at Sunseeker Brokerage. Built in GRP by British yard Sunseeker International, Anya was delivered in 2015 and, although she was built to LY3 code, has never been chartered. An interior in high gloss walnut accommodates 10 guests in five cabins comprising a main deck master suite, two doubles and two convertible twins, all with entertainment centres, television screens and en suite bathroom facilities. The large saloon of this yacht for sale has sliding doors to the aft deck and additional starboard patio doors which open onto a hydraulically controlled drop-down sea balcony offering panoramic views when in place, while forward is a formal dining area with seating for up to 10 guests. Exterior areas are optimised to offer several areas for al fresco entertaining and dining, including the aft deck which boasts ample seating and a bar. Up on the flybridge is a further outdoor dining area for up to 18 guests to port and a bar to starboard with three bar stools. Aft is a large glass fronted Jacuzzi with a sunbathing area and there is a retractable hard top. Further features include a hydraulic bathing platform, aft flybridge canopy and a stern canopy. Her top speed is 24 knots and she boasts a maximum cruising range of 1,500 nautical miles at 12knots with power coming from two 3,180hp MTU 12V4000M93 diesel engines. 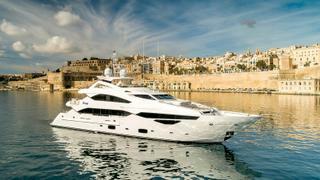 Lying in Malta, Anya is asking £10,750,00.